Contains Organic herbs! Also for rough and chapped skin by planing and falling! Promotes recovery processes of the skin and softens the skin. Calendula Skin Cream is used externally for its purifying and restorative properties. The cream is used as a universal body carer! Calendula (marigold) has traditionally been one of the most beneficial plants for the skin. To be used with rough, chapped and chapped skin (due to cold and dry air). This herbal balm supports the regenerative capacity of the skin. The skin repairs quickly and is cared for. Both the oil and the extract are used as the main ingredient in this powerful herbal balm. The balm is enriched with precious aroma oils (such as myrrh), herbal extracts and a blend of cold-pressed vegetable oils, waxes and fats. With regular use, the skin stays soft, cool and beautiful and this herbal balm is a welcome help in every family, for young and old. It restores and nourishes the skin. A red sensitive skin, which is difficult to repair, gets better condition by the Calendula Skin Cream. A chapped, red and fragile skin will become smooth and soft again with daily use. 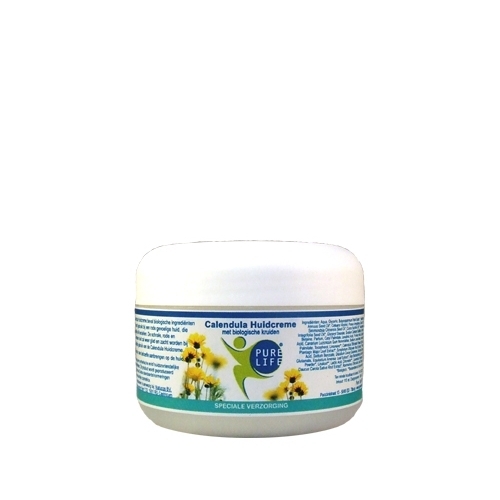 Calendula Skin Cream is also very useful for a vulnerable baby and children's skin. As well as daily care of the skin but also to use at chapped and red spots in the folds of the skin or by wearing a diaper. Contains no synthetic and / or skin-unfriendly ingredients. This product is produced according to German standards / standards for natural cosmetics. With our special care products we respond to the trend of 100% pure natural and organic natural cosmetics. They also comply with the new Cosmetics Regulation. Ingredients: Calendula oil (bio), Sheabutter (organic), Jojoba oil (bio), Cocos oil (bio), Almond oil, Calendula extract (organic), Wheat germ oil, Aloe Vera, Beeswax, Elemi oil, Vitamin E and Orange oil . INCI: Aqua, Glycerin, Calendula Officinalis (organic), Butyrospermum parkii (organic), Cetearyl Alcohol, Sodium Cetearyl Sulfate, Simmondsia Chinensis (organic), Cocos Nucifera (organic), Prunus Dulcis, Glyceryl Stearate, Triticum Vulgare, Fragrance Natural (perfume ), Aloe Barbadensis, Cetyl Palmitate, Sodium Cocoyl Glutamate, Salicylic acid, Cera Alba, Ascorbyl Palmitate, Canarium Luzonicum, (d-alpha) Tocopherol, Citrus Dulcis, Sodium Benzoate, Phytic Acid, Daucus Carota, Salvia Officinalis, Cedrus Atlantica, Origanum Majorana, Commiphora Myrrha, Citrus Nobilis, Lactic Acid, Citric Acid, Rosmarinus Officinalis, Vanilla Planifolia, Citronellol *, Eugenol *, Geraniol *, Linalool *, Limonene *. * component from Aroma oils Preserved with Salicylic Acid and Sodium Benzoate bio = from organic cultivation (organic). Calendula Foot Cream helps relax tired, burning feet. It nourishes the skin, refreshes the foot and promotes blood circulation. With regular use the skin stays soft and cool. Callus formation is also prevented. Aqua, Helianthus Annus, Glycerin, Cetearyl Alcohol, Sodium Cetearyl Sulfate, Calendula Officinalis, Glyceryl Stearate, Cera Alba, Lanolin, Butyrospermum parkii, Stearic Acid, Persea Gratissima, Cocos Nucifera, Simmondsia Chinensis, Camphor, Thymus Vulgaris, Cetraria Islandica, Fragrance Natural , Glyceryl Caprylate, Eucalyptus Globulus, Salicylic acid, Sodium Cocoyl Glutamate, Menthol, Hippophae Rhamnoides, Canarium Luzonicum, Sodium Benzoate, Lactic acid, Citric Acid, Phytic Acid, D-alpha Tocopherol, Melaleuca Viridiflora, Daucus Carota, Leptospermum Scoparium, Eugenol * , Farnesol *, Geraniol *, Linalool *, d-Limonene *. * Ingredient from Aroma oils. apply it as needed and massage it in if necessary. With regular use the skin stays soft, cool and beautiful and prevents calluses. 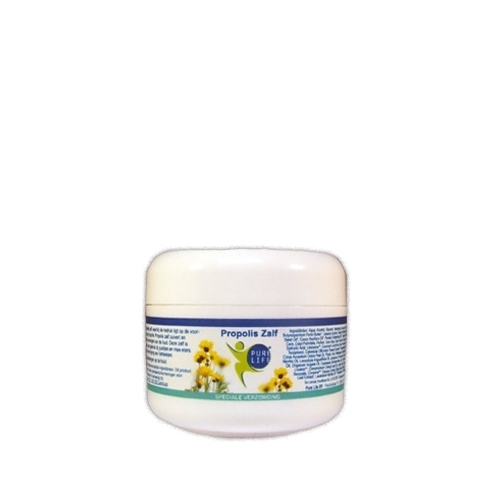 Propolis is a compound ointment, with the emphasis on the excellent properties of propolis. Propolis ointment purifies and supports the restorative capacity of the skin. This ointment is therefore extremely suitable for use in pimples and blackheads. Propolis supports the care of lip bubbles. Bees collect, among others, poplars, willows and fir trees brown-red nuggets of resin. This resin is processed into propolis by the bees. They cover the inside of their closet, basket or tree cavity and close the gaps and holes. This is the reason why propolis is also called kithars. It is the most important substance in the hive with regard to hygiene. The bees cover the fly hole with it, to protect the hive against harmful invaders. The list of substances found in propolis is long and is getting longer, because research is still in full swing. It consists of between 10% and 70% of resin, 14% - 40% of wax, 2% - 10% of various oils and 3% - 25% insoluble substances. Substances that have been found include flavones, vitamin E, various vitamins from the B complexes, fatty acids, a number of trace elements, essential oils and enzymes. Angustifolia Oil, Juniperus Communis Fruit Oil, Juniperus Mexicana Oil, Origanum Vulgare Oil, Cupressus Sempervirens Oil, Ormenis Multicaulis Flower Oil, Linalool **, Cinnamomum Cassia Leaf Oil, Lactic Acid, Potassium Sorbate, Sodium Benzoate, Cinnamal **, Lavandula Hybrida Oil . * Biological. ** Ingredient from aroma oils.